RPM Fest organizers have announced the 2018 full band roster for the late August music event. 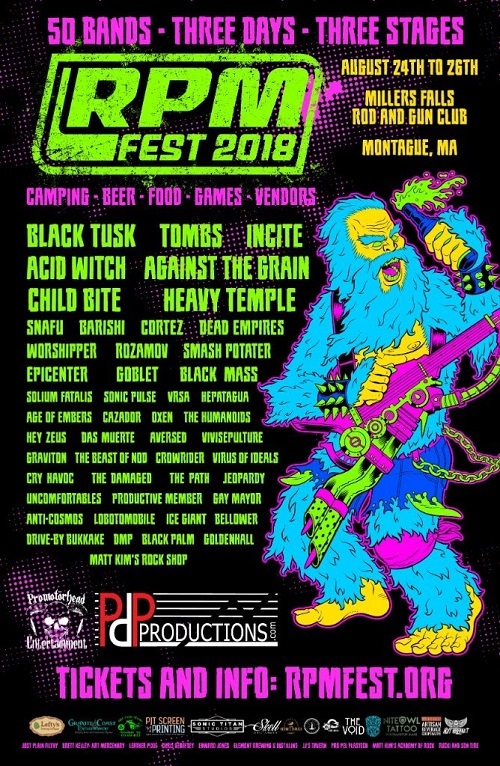 Held this year in Montague, Massachusetts, RPM Fest is an annual three-day outdoor heavy Rock, Punk, and Metal music festival that in 2018 features 50 bands, as well as camping, games, local beer and food, vendors, and more. This year RPM Fest brings in national headlining acts such as Black Tusk, Tombs, Incite, Whores., and Acid Witch, as well as additional local and regional vendors and festival sponsors for the 2018 event. Each year of RPM Fest has occurred in Western Massachusetts, and while the region is somewhat rural, it has been a hotbed for spawning nationally-recognized heavy music acts like Killswitch Engage and Shadows Fall. Since RPM Fest’s 2014 start, West Mass has seen a heavy music resurgence, with its goal to keep fostering the local heavy music scene by showcasing some of the best underground bands New England has to offer. RPM Fest is scheduled to take place from Friday, August 24th, to Sunday, August 26th at Millers Falls Rod And Gun Club. Early bird tickets go on sale Monday, June 4th.